At about this time every year, as the rain hammers on the window and the wind howls in the alley, thousands of us gaze longingly at glossy photos of Egypt, a tourist heaven scorched with sun all year round. People all over the world pore over perfect images of the three iconic pyramids at Giza, the noble avenue of the Spinxes at Karnak and the beautiful rock sculptures of Ramses the Great at Abu Simbel. Inspired by these postcard portraits of ancient grandeur, they sacrifice the traditional visiting in-laws for a Christmas spent with the Pharoahs. And as they wing their way effortlessly over frozen Europe, the lucky ones read excitedly of the tomb of Tutankhamun in the Valley of the Kings and shudder at the curse of the mummy. As the plane circles over Cairo and they peer through the windows in the hope of catching a glimpse of the Great Pyramid, as they touch down and the heat of the day fills their lungs, there is no question that their minds are filled with the beautiful, pure images that are peddled so successfully around the world. 8.1 million tourists visited Egypt last year and, with 9 million expected in 2005, more than ever before visitors to Egypt are finding trips to her premier monuments overcrowded and uncomfortable experiences. Demoralising days are spent peering over other people’s shoulders, jostling for position in front of ‘magical’ scarabs and being buffeted around by pushy guides under orders to keep the crowds moving. The throng of touts, hawkers and camel drivers gather like flies around the mass of sweaty tourists, all shouting for their attention. Sun, sand dust, flies and open drains assault the senses and can easily overwhelm the presence of the ancient. Yet, for every overcrowded monument on the tourist stampede trail, there are often several other sites nearby, just as awe inspiring and frequently deserted. The problem is one of publicity more than anything. Tour companies are lazy and the local Egyptians think that every tourist wants to see the same three sites. It is a sad fact that when one talks of ‘the Pyramids’ of Egypt most people think only of the most famous three at Giza. These are the most famous largely because, for thousands of years, they have been the most accessible, to Herodotus, to the Islamic scholars of the great Abassid Caliphate in Egypt, to the early Napoleonic and British explorers and finally to the modern visitor, who can book into one of several five star hotels and request a room with a view of the oldest tourist mecca in the world. But the truth is that the sprawling suburbs of Cairo have steadily throttled Giza, with its pyramids and smattering of other monuments, a condition reflected in the heavy surgery recently completed on the face of the Sphinx. Yet if it were down to the tour companies, no one would give a thought to any of the other ninety-plus pyramids in Egypt. The vast pyramid fields of Abu Sir, Saqqara and Dahshur are in fact only an hour’s drive south of Giza. Some tourists may already know of the Step Pyramid at Saqqara, some may even have heard of the ‘Pyramid Texts’, first found decorating the nearby Pyramid of Unas. But I would wager that none are aware of the Hellenistic Philosophers’ Circle, the eerily thrilling Serapeum and its catacombs for the cult of the Apis bull, or the Mastaba of Ti, with its illustrations of an Egyptian hairdresser’s rise to power, all of which can be found at Saqqara. The area around Dahshur has recently been de-militarised and re-opened to tourists and, if you are looking for the grandeur of Giza away from the crowds, comes most highly recommended. The two main pyramids are both awesome in size and breathtaking in execution, for differing reasons. The Red Pyramid was the first ‘pure’ pyramid to be constructed and is in fact second only in size to the disproportionately famous Great Pyramid at Giza. Furthermore, you will be able to explore the interior on your own, instead of having to accommodate the broad behinds of sweat drenched tourists and each step can be taken without the fear of some video camera wielding moron trampling you from behind in his fear of confined spaces. The Bent Pyramid at Dahshur is arguably even more astounding, starting off at a steep angle to the earth, before abruptly shaping to a point halfway up. It is here that we can best see how the method of pyramid construction was pioneered. The original limestone casing is still largely in place and one can only wonder at how the pyramids must have shone like fallen stars in the fierce desert sun. Once ‘The Pyramids’ have been ticked off, tourists to Egypt usually zap off down south to Luxor, whiz round the huge temple complex of Karnak, dash to the Valley of the Kings and leap onto the nearest five star cruise ship before anyone can tell them different. In fact, the most rewarding sites around Luxor are an hour or two’s drive north, at Abydos and Dendera. The temple of Seti I at Abydos is, without a doubt the finest temple that most tourists have any kind of access to, yet the vast majority of them do not make the short trip to marvel at its wonderfully fine raised reliefs, beautifully shaped out of the smooth rock. The Temple of Hathor at Dendera, whilst nowhere near as exquisite in its execution, is also worth a good look for its, very rare, well-preserved rooftop sanctuaries and (the cast of) the so-called Dendera Zodiac, now in the Louvre. Queen Hatshepsut’s Temple on the West Bank of Thebes is famous for being the site of the tragic tourist massacre of 1997. What few people realise is that it can be incredibly boring and a wasted journey for most, the unquestionably fascinating reliefs being almost invisible to the naked eye and protected from close inspection by rope fencing. Yet still coach load upon coach load of tourists (around 4 million a year) will dutifully trudge up the three flights of steps, take a few photos, gawp at a seemingly blank wall that the Egyptologist guide is inexplicably excited about and trudge back to their air-conditioned coaches. 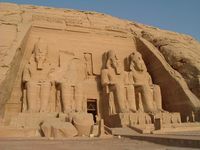 Curiously, the much more interesting mortuary temples of Ramses’ II and III lie untroubled by tourists and offer a far more rewarding experience for the discerning traveller. So why do people not take advantage of these great alternatives? The problem with travel in Egypt is that it is unquestionably easiest to do it with a tour, or at least through an agent with deep and personal knowledge of the way things work in the country. The alien nature of Egyptian customs, such as baksheesh, alms-giving and constant haggling, can be unsettling to the naive occidental tourist. So, in a state of abject fear, the wide-eyed, white-faced tourist throws a stack of money at the problem and books a horrendously priced tour from one of the big operators in this country. The most satisfying solution for the independent traveller who still wishes to travel with a certain degree of security is to avoid the big tour companies like the plague of locusts and head down to central Cairo to find a local Egyptian travel agent. Far from being the sly rip-off merchants who will take your money and abandon you that some people fear, engaging an Egyptian travel agent could prove to be the most rewarding decision you make on your trip, providing an easy route into native Cairene life that would be hard to achieve otherwise. I first stumbled into Mostafa’s office in April 2003, and, although sceptical, was swiftly charmed by his easygoing manner, disarming cousins and copious cups of tea. I left, maybe two hours later, with a crowd of new Cairene friends and a tailor-made tour for 7 days in the Nile Valley at a fraction of the UK cost (£60 each for my companion and I, including accommodation, travel and guides). Not only that, but we were taken for a raucous tour of Cairo’s nightlife by Mostafa that put our early morning rise for the pyramids in serious jeopardy. Fast forward to late August 2004 and I confidently led my family back to Mostafa’s, but was still a little surprised when he hailed me from the street as if I had left Cairo 14 days, not months, before. After brief negotiations between him and my father (6 day whirlwind tour of the Nile Valley, including 3 day Nile Cruise, air conditioned accommodation and all travel: £640 for four people), he invited us for a relaxing beer in the local bar with his cousins and a couple of Aussies he had befriended.